We live in a transformational time in the history of medicine and health care. The twenty-first century will be a time of dramatic change, incredible breakthroughs, and totally altered thinking about health, medicine, and health care delivery. This book sets forth what health care and medicine will look like in the years ahead. It takes a look at history, the transformational changes going on today, the health of Americans, the nine dynamic flows that are shaping health care in the United States, and definitions and descriptions of the new institutions of the future landscape of health care and medicine. It is already being called THE book to intelligently shape and guide the discussion and reorganization of health care reform in America. 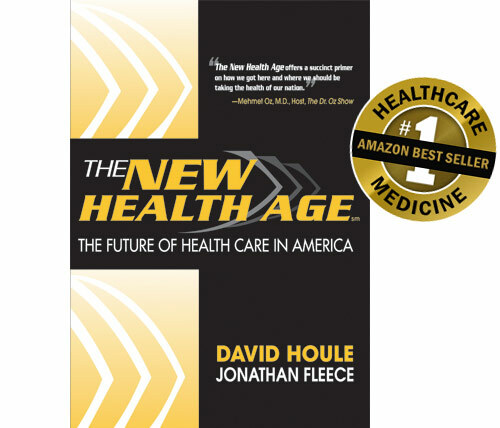 From leading futurist David Houle (recently named “Speaker of the Year” by Vistage International) and leading healthcare attorney Jonathan Fleece, comes this surprising, innovative look at the future of healthcare–and how we can lead the successful reorganization of healthcare in America. The New Health Age offers a succinct primer on how we got here and where we should be taking the health of our nation. The time is now and America is ready. This book lays out an inspirational plan for transforming our collective health that is sure to propel us on an irresistible path of new wealth, prosperity and happiness. David and Jonathan chart out in this book one of the most important and hopeful national health and policy agendas for the twenty-first century – ‘The Race to a Healthy America.’ Every patriotic American should read this book and join us in the Race! Our future good health and prosperity depend on it. Employee wellness and effective health plan benefit design is what will separate the ‘winners from the losers’ in corporate America going forward. Read this book and every American business can learn how to fall on the winning side of this race.